Crater Lake is 2000 feet deep. Though it gets plenty cold during its long winter, it is rare that the lake freezes over completely. 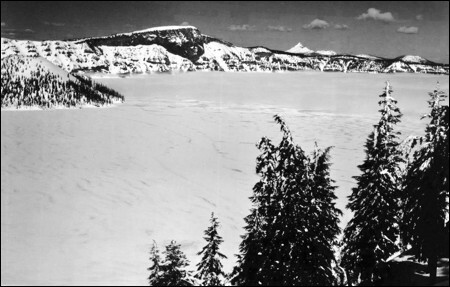 Since Crater Lake National Park was established in 1902, the lake has frozen over only once, in 1949. I remember talking with a Klamath elder in the 1980s who told me that his people had memories in their oral tradition of the lake freezing over, but I have yet to uncover a reference to those memories anywhere in the native literature. But these writings constitute a small portion of a mythology that was fractured nearly to bits in the 1800s. I witnessed a near-freezing-over in 1985, but 1949 was the real deal. The lake was frozen deep enough to support several feet of snow. 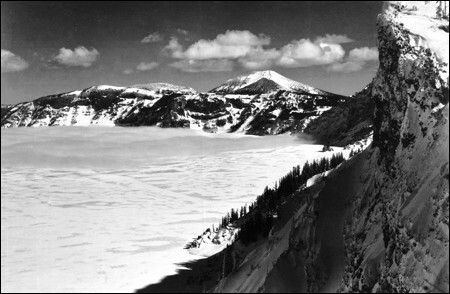 On March 14, Duane Fitzgerald, acting Chief Ranger, and George Ruhle, Chief Naturalist, made their way 2000 feet down the snowy caldera wall and walked across the lake to Wizard Island. These photos were taken in January, 1949.